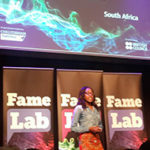 Emmie Chiyindiko, FameLab SA Winner and MSc student at the University of the Free State is in the United Kingdom this week, hoping to secure a place in the FameLab International Final 2018! FameLab winners from 30 countries will participate in the semi-finals that take place over three rounds on Wednesday 6th June at the Cheltenham Science Festival. The international finalists will then battle it out on Thursday 7th June between 9.45pm and 11.15pm (SA time) in front of a live audience and the judges: Vivienne Parry (science writer and broadcaster), Clifford Johnson (Professor in Physics and Astronomy, author and science communicator) and Farrah Nazir (Acting Creative and Partnerships Lead, Wellcome Trust). South Africa’s Tshiamo Legoale took the prize in 2017 – will Emmie (below, 2nd from left) also enlighten and entertain her way to the top? To do so, Emmie will have to effectively communicate her research in under 3 minutes. Emmie’s work focusses on using techniques such as electrochemistry and computational chemistry to explore how various metal complexes can be used to increase the efficiency of industrial processes. https://jivemedia.co.za/wordpress2/wp-content/uploads/2018/06/JiveMedia_FameLabInternational_Finals2018_Header.jpg 190 575 Jive Media https://jivemedia.co.za/wordpress2/wp-content/uploads/2018/07/jive-logo-white-text.png Jive Media2018-06-05 09:07:202019-04-04 12:14:09FameLab International 2018 is here!